This Gospel Book waswritten on the Continent in the 10th century, but reached England fairly soon thereafter, as shown by textual additions ranging in date from the 10th to the 15th century, which relate to Thorney Abbey, in the Fenlands between Peterborough and Wisbech. 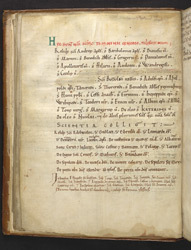 Clear evidence that this manuscript belonged to Thorney is this list of relics owned by the abbey. It is arranged in order of the importance of the saints, with the apostles Andrew and Bartholomew first. The are followed by other the male and female saints, and then by parts of inanimate things: a piece of the Holy Cross, of The Virgin Mary's tomb, etc. Four lines added at the bottom of the list start with a piece of the scourge of St. Guthlac, the most important local Fenland saint.